NETWORK UPDATE: ONCE UPON A TIME and RESURRECTION both received extra 0.1s in final Sunday numbers, as did MADAM SECRETARY and BROOKLYN NINE-NINE. SUNDAY NIGHT FOOTBALL adjusted to 6.6, 0.8 below last week’s game. There wasn’t much suspense as to what would lead cable on Sunday night, and THE WALKING DEAD did it in record-breaking fashion, with an 8.65 rating and 17.3M total viewers. (Someone asked specifically about the show’s rating with Women 18-34, and that was consistent with the overall rating at 8.4.) 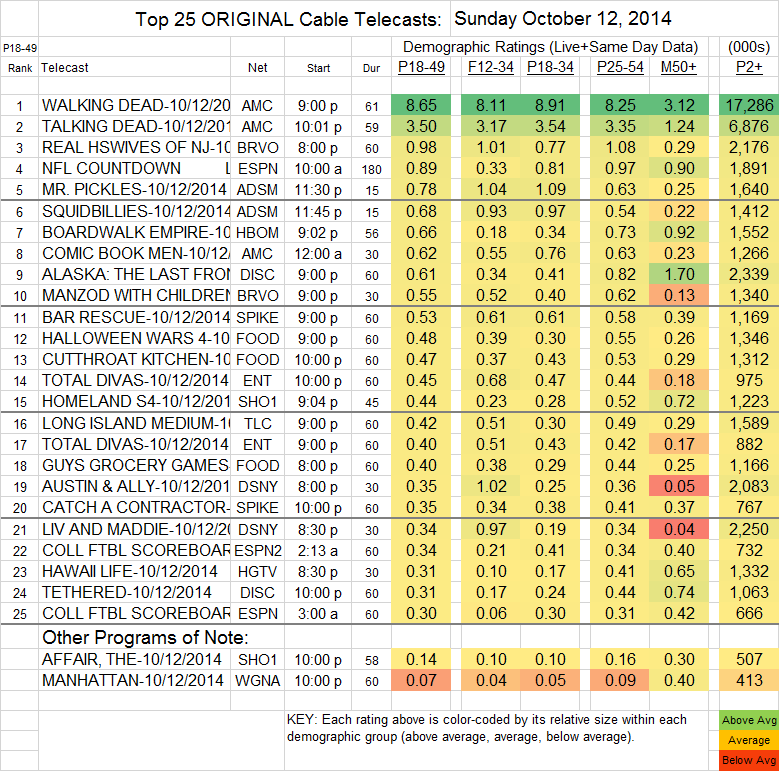 TALKING DEAD followed, huge in its own right at 3.50, and COMIC BOOK MEN, airing at midnight, was at 0.62. It was a bad night to premiere a new drama, and Showtime’s THE AFFAIR, despite mostly excellent reviews, had a slow start at 0.14, although a bit of that may be attributable to the episode being available online for 1-2 weeks before the official premiere. HOMELAND, airing directly against WALKING DEAD, lost 0.12 from last week’s season premiere to 0.44, and HBO’s BOARDWALK EMPIRE dropped 0.14 to 0.66. REAL HOUSEWIVES OF NEW JERSEY (Bravo), however, was up 0.02 to 0.98, while MANZOD WITH CHILDREN dropped 0.14 to 0.55. The Adult Swim pair of MR. PICKLES and SQUIDBILLIES were up a respective 0.10 and 0.14 to 0.78/0.68. ALASKA: THE LAST FRONTIER (Discovery) lost two-tenths to 0.61. WGNAmerica’s MANHATTAN, despite its miniscule numbers (up 0.02 to 0.07), was just renewed for a second season, intended as it was as a prestige play by the fledgling network rather than a ratings smash.